The IceHogs had a home-and-home series against the Chicago Wolves during week 25 of the AHL schedule. The I-90 rivalry is normally good for providing entertaining match-ups, but there were a few more adventures than normal this weekend. The IceHogs traveled down I-90 to Rosemont on Friday night. On the scoreboard, it was all Chicago, all the time. The Wolves took the game 6-0. Kent Simpson was in net for Rockford, but only one of the goals could be considered his fault. He didn’t get much help from in front of him defensively. The most “exciting” parts of the game came when tempers flared. In the second period, Eric Selleck fought Pat Mullane and IceHogs captain Jared Nightingale did not approve. He came off the bench, seemingly to talk to the referee about the penalties, but ended up going at Selleck; Nightingale landed a pretty good left, too. Nightingale was handed 2 for instigating, 5 for fighting and a 10 minute misconduct, but was suspended the next day for 6 games for leaving the bench. Later in the second period, Bobby Shea and Ty Rattie got into it after Shea elbowed Rattie in the head. A scrum with the majority of the players on the ice ensued and both Shea and Rattie were sent to their respective dressing rooms after getting fighting majors since there was only 34 seconds left in the period. As they were walking down the tunnel on their respective mats, Shea got on his knees, crawled across the concrete to Rattie in order to avoid stepping on it with his skates, and went after him again. The police in the tunnel had to break them up. Shea was then handed another game misconduct, in addition to the one he received for elbowing. In the third period, Brandon Mashinter got a hold of Selleck and bloodied him in a good bout. Other than that, the third period was quieter than most people expected it to be. -The Wolves outshot the IceHogs 37-23. -The IceHogs failed to convert on their lone power play whereas the Wolves converted on 2 of their 5 man advantages. 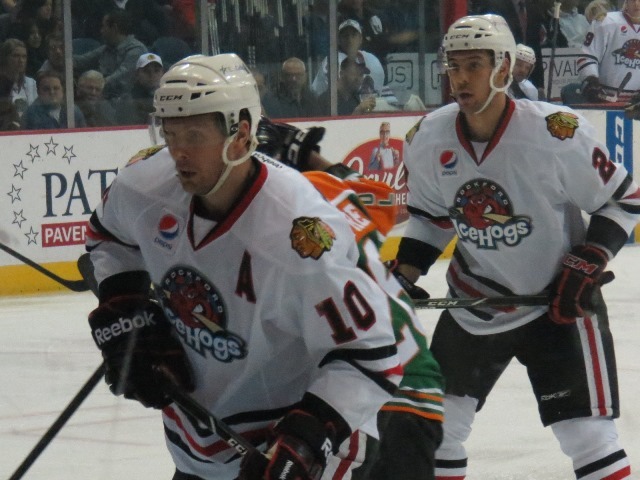 -Defenseman Adam Clendening led the IceHogs with 4 shots on goal. -Defenseman Bobby Shea was suspended for 9 games for his elbow on Ty Rattie and for fighting off the ice. His total penalty minute count for Friday’s game was 30. -The three stars of the game were: 1 – Keith Aucoin (1 G, 2 A, +2, 1 SOG) 2 – Jake Allen (23 saves) 3 – Adam Cracknell (1 G, 1 A, +2, 2 SOG). 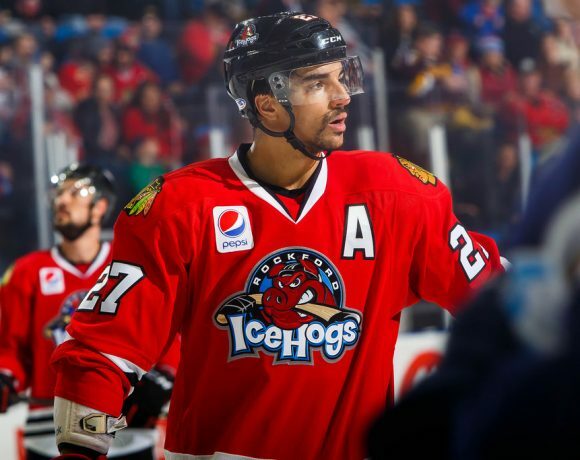 -The scratches for the IceHogs were: Viktor Svedberg (injured), Wade Brookbank, Mathieu Brisebois, Theo Peckham and Philippe Lefebvre (all healthy). Saturday night was a completely opposite game for the IceHogs and Wolves. There were only two goals scored during regulation and they both came during the second period. Cody Beach scored on a breakaway, but Brad Mills tied the game up with 42 seconds remaining in the middle frame. 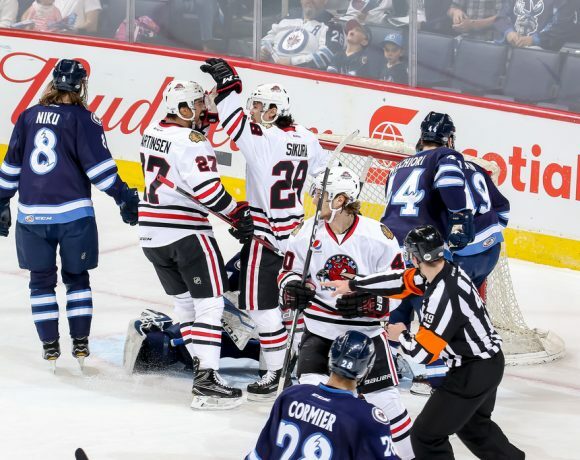 The game went into a shootout where Jason LaBarbera only let one puck by him and the IceHogs scored twice in 5 rounds in order to pick up the 2-1 victory at the BMO Harris Bank Center. -The Wolves outshot the IceHogs 36-33. -The IceHogs failed to covert on all 3 of their power plays and they killed off all 5 Wolves man advantages. -Forward Pierre-Marc Bouchard led the IceHogs with 4 shots on goal. -The shootout order for the IceHogs was: Brad Mills (no goal), Joakim Nordstrom (no goal), Garret Ross (goal), Pierre-Marc Bouchard (goal) and Terry Broadhurst (no goal). -The three stars of the game were: 1 – Jason LaBarbera (35 saves) 2 – Matt Climie (31 saves) 3 – Brad Mills (1 G, +1, 3 SOG). -The scratches for the IceHogs were: Viktor Svedberg (injured), Jared Nightingale, Bobby Shea (both suspended), Pat Mullane and Brett Skinner (both healthy–probably). –Thursday, March 20 – The Blackhawks reassigned forward David Gilbert to the IceHogs from the Toledo Walleye (ECHL). –Friday, March 21 – The Blackhawks recalled winger Jeremy Morin from Rockford. –Tuesday, March 25 – The IceHogs signed defenseman Trevor van Riemsdyk to an AHL contract. –Brandon Mashinter continues to be a key part of the IceHogs line-up. His presence helps keep the other team in-check in terms of physicality and fighting. –Brad Mills played well on Saturday. He was solid in all situations, especially on the penalty kill where it really matters. He scored a big goal on a deflection of an Adam Clendening shot to give the Hogs hope and keep things equal on the scoreboard. –Mathieu Brisebois played well on Saturday as well. He has a heavy rocket of a shot from the point that could be very useful for the IceHogs down the line. He also looks good in the defensive zone. 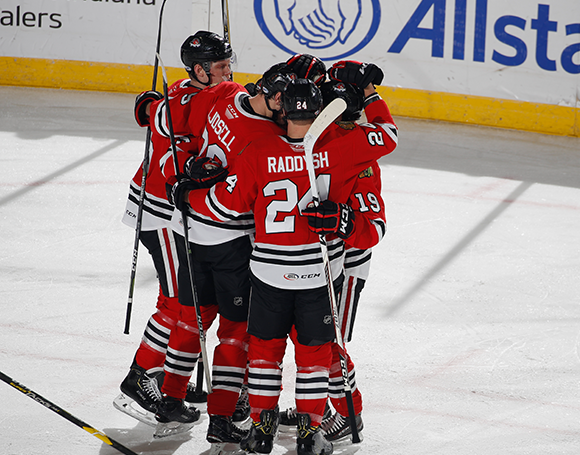 -The IceHogs now have a record of 31-25-5-4 (71 points) and are in 7th place in the Western Conference standings. Friday, March 28 vs. Grand Rapids at 7 p.m.
Sunday, March 30 vs. Chicago at 4 p.m.
*Grand Rapids is in 2nd in the Western Conference with a record of 41-19-2-4 (88 points) and leads the Midwest Division; the Griffins have 66 games played, which is 1 more than Rockford. Chicago is in 4th in the West with a record of 37-19-5-3 (82 points); the Wolves have 64 games played, which is 1 less than Rockford.